Hurricane Fabric”s load disbursement system is the only hurricane screen system that addresses some basic engineering problems with many hurricane screens systems today -while solving the problem. When fabric was 1st used in the United States, the testing labs geared all their tests towards metal products. Many of the tests became more stringent after Hurricane Andrew. The problem with using these same tests for fabric products centers around the separation of the wind and impact tests – such as the Miami/Dade PA 201. Fabric is different than metal and is visibly stretched back during a storm. The problem with using tests geared towards metal products is that when the fabric is in this stretched position – it is significantly more vulnerable to not stop an impact. Hurricane Fabric”s system corrects this defect using a flexible clip that allows for a screen to receive and impact even if there is a wind load on it. How could the testing labs miss this? Simple, they relied on the manufacturers to test in good faith and fabric was not widely used. No one said anything, until now. ..Tests for fabric products centers around the separation of the wind and impact tests – such as the Miami/Dade PA 201..
Our system is different – as the wind gets stronger, the flexes and reduces and disburses the wind load. It”s such a great idea – its patent pending. 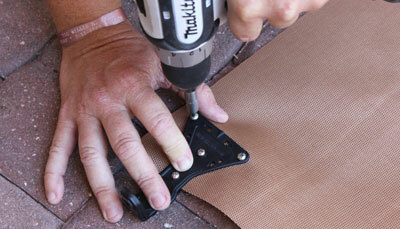 Choose Hurricane Fabric and be safer during a Hurricane.